Prototype: Swiss Federal Railways (SBB/CFF/FFS) class Ee 3/3 switch engine. "Fir Green" basic paint scheme. Second production series starting in 1932, with a cab in the middle. 2 switchman platforms. Locomotive road number 16356. The locomotive looks as it did around 1950. 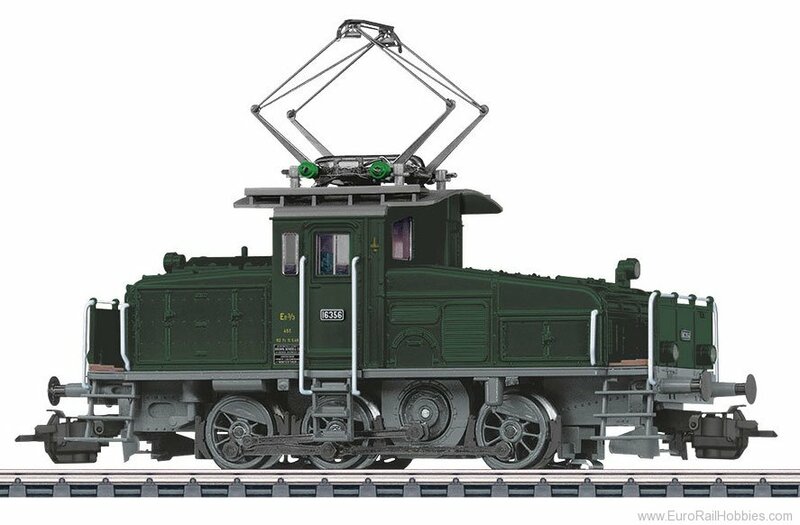 Model: The locomotive has an mfx digital decoder and a miniature can motor with a flywheel. 3 axles and a jackshaft powered. Traction tires. The triple headlights and dual white marker lights will work in conventional operation and can be controlled digitally. The locomotive also has Swiss headlight / marker light changeover with a white marker light when the locomotive is couple to cars and a red marker light when the locomotive is running "light". These lights can be controlled digitally. Maintenance-free warm white and red LEDs for used for the lighting. The roof equipment is separately applied. The locomotive has separately applied metal grab irons. Brake hoses and prototypical couplers can be installed on the buffer beam. Length over the buffers 11.2 cm / 4-7/16".